While one must thank the foreign secretary (FS) for reminding us that Myanmar is our neighbour, there are a few points he is reported to have made on September 20, at a roundtable involving multiple stakeholders engaged with the response to the Rohingya crisis, that one could take issue with. Indeed, Myanmar is our neighbour, whom we have neglected in the past. Not surprisingly, we were engrossed, most of the time, in formulating policies to survive and exist with our only other neighbour, which predominates not only Bangladesh; its presence is overwhelming in the region too. Myanmar has been treated as a peripheral concern which received the attention of the foreign office mandarins, perhaps only during their free time when they could afford to get away from their preoccupation with India. Thus, what we had in respect of Myanmar was a situation where the foreign office played it by ear instead of going by a well-defined policy, to deal with the Rohingya issue. It is true that there is a well ingrained impression, not altogether groundless, in the minds of the public that Bangladesh has been dealing with Myanmar on the Rohingya issue with kid gloves, as if we couldn’t be too cautious of stepping on Myanmar’s toes. Given the foreign ministry’s mindset, as evident from the FS’s comments—and that dictates the policy—it is not difficult to guess why our actions in response to the Rohingya issue, where we were faced with a million refugees in 2017, have lacked the robustness it deserved. Having only a few countries to share our borders with can be both a boon and a bane. And Bangladesh, having two neighbours only to deal with, has been ad hoc at best in its response to its eastern neighbour. 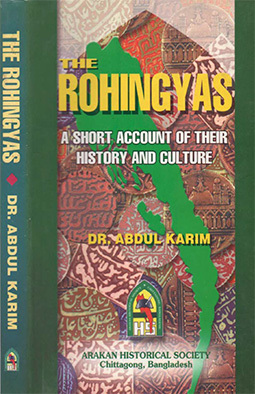 And one would not be remiss to suggest that our reactions to the Rohingya issue, which we have been faced with since 1982, hardly reflect a well-considered strategy, if there is one. Foreign policy constitutes the first, second and third line of a country’s defence, at least, that is so in our case. The military is the fourth if foreign policy fails. It cannot afford to be static; every developing situation must be factored in to bring in the required dynamism to the approach that would help formulate the operational plans to fulfil the aim. Whether or not that delivers the objective and upholds the national aim and national interest, only the results would make evident. We, therefore, ask whether the plans we have adopted so far have paid off, and whether it would get the Rohingyas back home to live as equal citizens like other ethnic communities in Myanmar. In our estimate we are still in square one, not a single refugee has gone back as of yet. Myanmar’s staunchest allies, who are our good friends too, have not budged from their steadfast support of it. They have repeatedly stonewalled every effort of the international community to generate a common action plan to hold the rulers in Naypyidaw to account. And which would target not only the military but also the civilian leadership which was complicit in the genocide of the Rohingyas. The OIC has been inert at best, occasionally coming out with statements to show that it is aware of the issue. Given that scorecard, it would be hard to say that our strategy has been very effective. It would be appropriate to analyse the three points that have affected the thinking of the foreign office in dealing with the Rohingya issue. 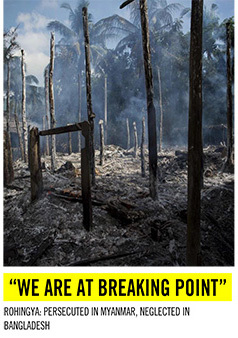 The FS is quoted as saying that our narrative was that Myanmar is our neighbour and they will continue to be so. The dilemma was how far do we go. One fails to see the dilemma here. There should not be any predicament if we did our calculations right. We must go the whole hog and there should be no compromise, neighbour or not. We are seeking neither favours of Myanmar nor imposing anything illegal on it in demanding a total and complete repatriation of the Rohingya refugees immediately. We are unable to comprehend another of his comments. He sees an even bigger predicament in figuring out what kind of rights the Rohingyas will be given and how much of that would affect our national interest. He sees it as a tricky balance. I must admit I am unaware that there are different kinds and degrees of rights. Our impression is that one has full rights or not at all—those rights are well expressed universal principles that are indivisible, and do not come in multiple denominations. It is not dished out as a manna in halves and quarters and dimes. And as for the Rohingya rights, we are absolutely not the arbiter and are in no place to engage in any haggling with the Myanmar authorities about this except to demand of the Myanmar government, and urge the international community, to bring to bear on Naypyidaw, to restore all the rights, in full, to the Rohingyas that a citizen of a country enjoys. Anything short of that should be unacceptable. We would appreciate an elucidation of how the rights issue might impinge on our national interest, as the secretary had averred in his comments. Is it our objective to see the repatriation as quickly and at any cost, even if it means acceding to the Myanmar plans to abridge the inherent rights of the Rohingyas? If that is so then the idea stems from an erroneous premise. However, that may serve our interest in the short-term, by ending the burden we are enduring. But that will be only a temporary respite. We have seen this issue incrementally increase in intensity since 1982. A temporary respite with a short-sighted solution will ensure its repetition, next time with even more intensity one fears. The call to redraw our Myanmar strategy merits consideration. 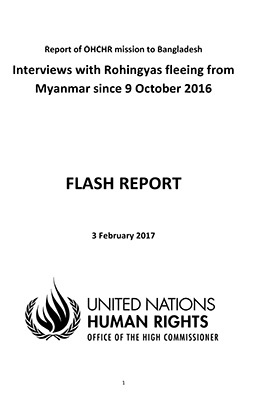 Very little that has happened since August of last year on this front for a permanent resolution of the Rohingya issue, supports the suggestion that, “the current direction taken is the right one.” We must not forget that we are dealing with a crafty neighbour, who has proceeded with a long-term Rohingya plan. It is a classic example of someone creating his own problems and then exporting it to its neighbour. We need an appropriate strategy to face it.